If you enjoy outdoor activities such as camping or garden barbecues, a screen tent (also known as screen canopy) would be very useful to keep you sheltered away from mosquitoes and weather related discomforts such as too much sun or rain. Screen tents can also be used for storing things, for serving meals, for changing if you want to take a swim, and for providing a place to sleep for you and your family. - It should be easy to carry. 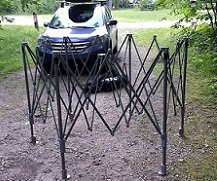 - It should be easy and fast to set up and fold down. - It should be spacious enough to accommodate not just yourself, but friends and family. - It should have a solid and durable frame made of either steel or fiberglass. - It should be made of with at least 150 Denier fabric. - It should provide 50+ UV Guard sun protection . 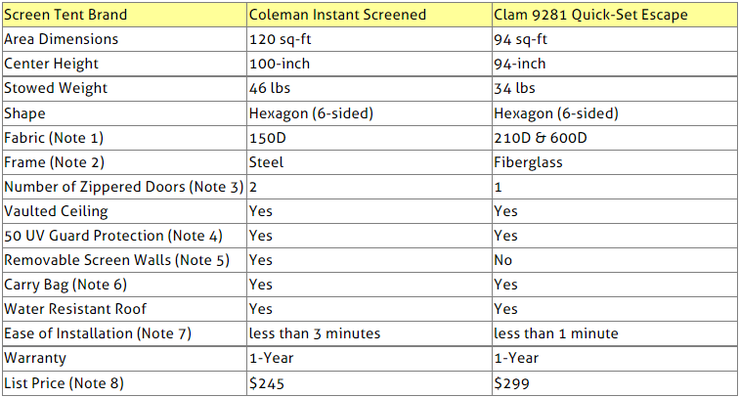 This article will compare the Coleman Instant Screened and Clam 9281 Quick-Set Escape screen tents. These were not just the most popular among Amazon customers at the time this article was written, but they had also received excellent reviews from most Amazon buyers (an average of 4.5 stars each out of 5 stars!). Note that these two screen tents fulfill all the requirements listed above. However, they are not identical and present some major differences. This article will explain these differences so you may choose the right screen tent for your needs. D is an abbreviation for "Denier", the unit of measure for the linear mass density of fabrics. Canopies with 150D and more fabric offer excellent SPF 50+ UV protection against the harmful sun’s rays. (SPF = Sun Protection Factor). ​Clam uses 210D fabric for the walls and 600D for the roof. Coleman has a 28mm steel frame. Clam has an 11mm fiberglass frame. 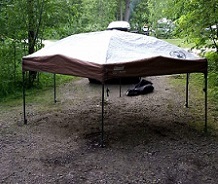 Therefore the Clam screen tent is lighter and lest prone to rusting. Coleman has two large doors for easy entry in the front and back. The doors are equipped with loops to keep doors open and zippers to keep them shut. Clam has only one door with a zipper. All other screens are sewn in place. Both the Coleman and Clam screen tents provide SPF 50+ UV Guard sun protection that block sun's harmful rays. With Coleman, the screen walls hang and they attach via hooks from the inside of the frame. They need to be removed before storage. With Clam the screen walls are sewn in and are not removable. If they were, it would have destroyed the integrity of the pop-up installation system. Coleman‘s bag has wheels. 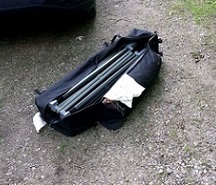 The compact frame folds down and fits into an easy-pull wheeled carry bag that fits inside most cars. Clam's carry bag is equipped with double shoulder straps but no wheels. The bag measures 72” x 8” x 8”. The set up procedure of these screen tents is quite different. 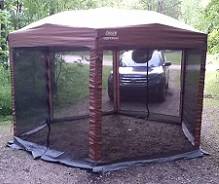 To install the Coleman screen tent, you will need first to deploy the frame, then install on it the roof which is attached using Velcro strips, and the screen walls which are hung using hooks and loops. It takes a few minutes to accomplish the task. 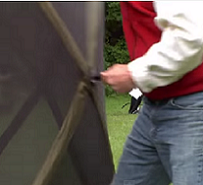 To install the Clam screen tent all you need to do is deploy the frame. The roof and screen walls are already attached to it, and thanks to the pop-up design, all you need to do is pop up the roof and the various screen walls. 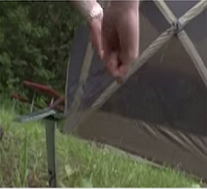 Both the Coleman and Cole screen tents come with what is needed to fasten the tents to the ground for stability. 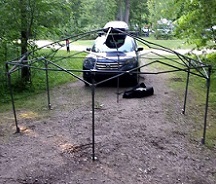 Step 1: Place frame on camp ground. Step 3: Add roof using Velcro strips. 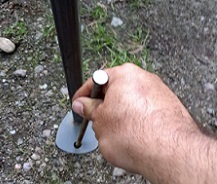 Spe 4: Adjust height by pressing the red buttons on the poles. Step 5: Hang screen walls by using the hooks and loops. Final Step: Fasten the feet to the ground. 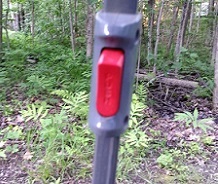 Red Buttons are used to adjust height. Step 1: Deploying the screen tent. Step 2: Popping out the screen walls. Step 3: Popping up the roof. Step 4: Anchoring down with tie-downs. Screen tent ready to enjoy! The prices shown are List Prices in effect at the time this article was written and may have changed. For exact price information, please click the product image links in the Amazon section below. Note also that the Amazon price often includes a good discount on the List Price. If a discount exists, both the List Price and the Amazon price will be shown when you click the product image links in the Amazon products section below. So which of the two screen tents to buy? Though it's called Coleman Instant Screen, it takes more than an instant, more precisely a few minutes to set up the Coleman canopy as described in Note 7 above. This is because you will need to install both the roof and the screen walls on the frame. On the other hand, thanks to its pop-up design, the Clam screen tent takes less than a minute to set up, and there is hardly anything to install on the frame as the walls and roof are already attached. 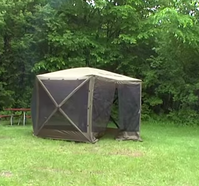 Also, with the Coleman screen canopy, when you want to fold it down, to store or carry, you will need to remove the roof and the screen walls, which is not the case with the Clam screen tent. 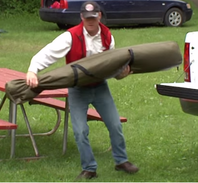 The Clam screen tent has only one door, while the Coleman has two doors. In addition, the screen walls on the Coleman are removable while those on the Clam canopy are not. So when the weather is nice, and you want to enjoy the feeling of being in the middle of nature, you can do it with the Coleman by removing the walls, but not with the Clam. Note that Coleman's frame is made of steel, while Clam's frame is made of fiberglass. As fiberglass is non-corrosive and is also lighter than steel, this might be a point of consideration for some. 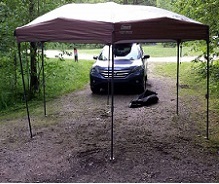 Finally, keep in mind when you choose that the Coleman canopy is larger (120 sq-ft vs. 94 sq-ft), and it will accommodate larger groups of people. However, larger Clam screen tents with features similar to Clam 9281 described above are available (see the Amazon products section below). Please click the screen tent of your choice below for price information or to purchase. Are you also interested in camping cots for your screen tent? The following article compares three of the most popular camping cots available on Amazon: Compare Popular Camping Cots.